Nowadays watching video online is becoming a tendency, and lots of video websites grew to such a large mass, like YouTube, Vimeo, Dailymotion, Break, Spike, and Metacafe. As one of the most popular video websites uploading and sharing videos, Metacafe provides millions of interesting videos including music videos, video games, movies and TV. Meanwhile, another point, how to save metacafe video, draws people’s attention. Preferring to rip videos off metacafe for free without downloading any program or shareware always occupies in your mind. Well, Video Grabber is exactly such kind of metacafe grabber. Technically, Video Grabber can let you capture videos from metacafe and other video websites easily, like YouTube, Vimeo, Dailymothion and so on. For example, you can totally grab vimeo video. It’s simple and completely free. Grab a URL of a metacafe video and paste it in the blank, just like the picture below, then you’ll get your videos by clicking “Download”. Moreover, people are concerned about not only how to grab metacafe video, but also convert metacafe videos to your ipod, iphone, PSP, and Mobile Phone so that you can watch videos wherever and whenever. In this issue, Video Converter can exactly help you. Video Converter has no adware, no spyware, no malware or other unwanted software, it is a kind of functional software that can convert videos to any formats for your DVD, Apple, Android, Sony gadgets, etc. It supports AVI, AMV, MKV, MP4, WMV and many other formats. It also can edit video and set videos’ subtitles. The operation to convert is very easy. After setting the output options by clicking “setting”, press “Add” to import video, and then start to convert video by clicking “convert”. Well, maybe some people would cavil at the trouble of doing a whole thing with two kinds of software. Isn’t there software that can do them all? Actually there is. Video Grabber Pro is the one. Like I said, Video Grabber Pro is kind of multifunctional software to rip metacafe video, including download and convert function. There aren’t many differences between the operations of Video Grabber Pro and the two kinds of software mentioned above. 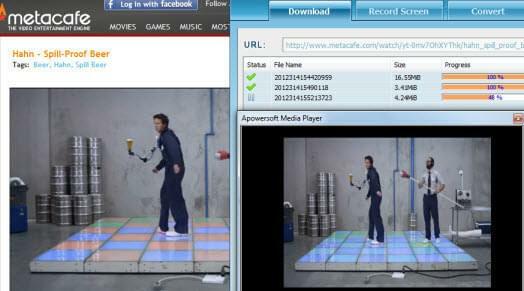 FYI, the download function of Video Grabber Pro is more powerful than Video Grabber. In a word, if you want to capture metacafe video for free and convert into your favorite formats, you should choose Video Grabber and Video Converter; if you want to do them all together, Video Grabber Pro would be your best choice. With no matter which one of three kinds of video grabber and converter I recommended above, you shouldn’t be bothered about how to save videos from metacafe and can enjoy your videos freely. why mp4 video cannot been download? Hey faiz, would you please tell me which site do you want to download from? It will be our honor to help you out.